CUSTOM ENGRAVED - 14K Tri Tone Color Valentino DC Baby ID Bracelet - 5+1"
Huge Savings Item! Save 11% on the CUSTOM ENGRAVED - 14K Tri Tone Color Valentino DC Baby ID Bracelet - 5+1'' by Jewelry by Ioka at Blood of The Young. Hurry! Limited time offer. Offer valid only while supplies last. CUSTOM ENGRAVED with your choice of letters in SCRIPT or BLOCK font! These items cannot be returned or refunded because of their customization. CUSTOM ENGRAVED with your choice of letters in SCRIPT or BLOCK font! These items cannot be returned or refunded because of their customization. Please message us with the characters/font you would like engraved. Explore the collection of Jewelry by Ioka with pieces made using high quality materials which are beautifully handcrafted using genuine 14K gold and the highest quality cubic zirconia (CZ). Our inventory boasts stunning pieces at affordable prices without compromise. Our assortment of fine and fashion jewelry is individually inspected to ensure they meet our standards to offer stunning jewelry to compliment your fashion needs. Jewelry by Ioka is guaranteed 100% authentic and conflict free. 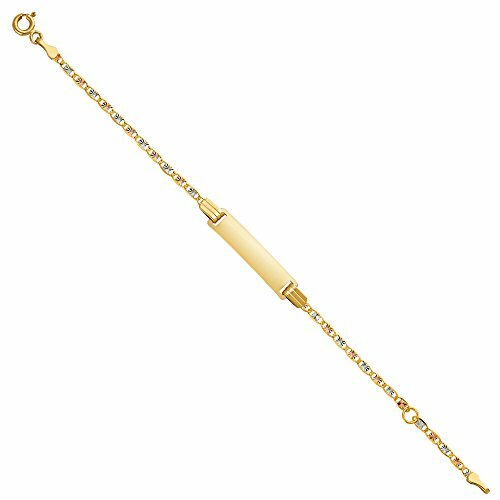 Gold jewelry pieces are beautifully crafted in 14k gold with the highest craftsmanship level and jewelry finish. Ships same day if order received by 2:00 PM PT; free First-Class shipping with tracking. Lifetime complimentary repair service on manufacturing defects. Satisfaction guaranteed. 30-day, hassle-free return policy. Best in class Customer Service - business hours from 7am PT to 8pm PT every day, you can expect a response within 2 hours of emailing us. Outside of business hours, we will return your message within 8 hours. ✅ PERSONALIZED ENGRAVING: Please email us with the LETTERS and FONT (Script or Block) you wish to have engraved. ✅ CUSTOMIZATION IS NON-REFUNDABLE and NON-RETURNABLE. If you would like extra pictures, of the item please message us. If you have any questions about this product by Jewelry by Ioka, contact us by completing and submitting the form below. If you are looking for a specif part number, please include it with your message. CUSTOM ENGRAVED - 14K Yellow Solid Gold Figaro 3+1 WP Baby ID Bracelet - 6"
CUSTOM ENGRAVED - 14K Yellow Solid Gold Figaro Plain Baby ID Bracelet - 6"
CUSTOM ENGRAVED - 14K Yellow Solid Gold Hollow Figaro 3+1 Baby ID Bracelet - 6"
CUSTOM ENGRAVED - 14K Two Tone White and Yellow Solid Gold Figaro 3+1 WP Baby ID Bracelet - 5+1"
CUSTOM ENGRAVED - 14K Yellow Solid Gold Stamp Cuban Link Baby ID Bracelet - 6"
CUSTOM ENGRAVED - 14K Tri Tone Color Stamp Figaro Link Baby ID Bracelet - 6"
CUSTOM ENGRAVED - 14K Yellow Solid Gold Hollow Cuban Baby ID Bracelet - 6"